Memorable Magic for Family Audiences! Trying to find the right Lancaster, PA Magicians that offer a family friendly show and appeal to all ages can be an aggravating task. However, let one local magical entertainer – Eddy Ray help ease your fears by providing high caliber family FUN entertainment that’s perfect for kids and ADULTS! Every magic show is a BLAST and is catered to properly entertain the ages attending YOUR event! Eddy Ray is a full-time professional Family and Kids Magician who performs his highly interactive and fun magic show all over Pennsylvania (including Lancaster). 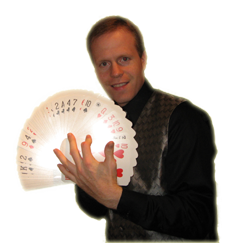 This Top Magician has performed at birthday parties, private events, corporate parties, and schools just to name a few. Some clients include The Make A Wish Foundation, Berks County Agricultural Center, Governor Mifflin Community Library and more. Simply Fill Out The Form Below For Free Info And Pricing, There Is No Obligation! Hiring Tips For Magicians, Let’s Make Your Job Less Stressful! Ask the magician if they have client testimonials. This should be a given. Unfortunately many magicians in Lancaster PA can’t provide this information. How do you know this magician is reputable, professional, and full time? Eddy Ray can provide you with testimonials, he is full time and is very reliable. Do magicians the area offer a guarantee for their services? Some may, some may not. By choosing a magician who offers a guarantee of services rendered for magic shows should be considered a strong candidate. Only a confident magician, one who is talented and professional would ever offer a guarantee. An amateur or hobbyist would likely have too much to lose as they might lack the professionalism and memorable show you deserve for your event. Eddy offers a 100% satisfaction guarantee for every show and event he schedules. Does the magician you contacted work as an agency? There are some magic related agencies out there who send out any magician for a show. How do you know if the magician they are sending to your event is going to be good, or even the right fit? Some of these agencies don’t even have a picture of the magician that will be attending and performing at your event. Don’t hire a magician blind. Make sure you know who will be coming to your event! You deserve much better then some agency sending Joe Smith to perform. Lastly, beware of hidden fees by some of these agencies. Magicians like Eddy Ray are few and far between because of the level of professionalism and talent. Eddy has traveled the world performing for audiences and has appeared on stage at the Tropicana Casino in Las Vegas and for America’s Got Talent. He is a rising star in magic and even is an accomplished author and teacher with magic products such as books and dvds that are available for sale worldwide. Magician Eddy Ray is truly one of a kind and offers the most amazing, unique, and FUN entertainment packages around! Don’t wait until it’s too late to hire Eddy as his schedule can be booked well in advance. Contact him now to see what time slots and dates might be available. Even if last minute, give Eddy a ring or email and see what he can do for you. Browse around the website to find more show details, a client list, more testimonials, pictures and much more of the areas busiest magician! Eddy Ray offers personal and direct service, and wants to help you create a memorable event. Contact him now. As he performs over 10 shows a month, dates and times are very limited. Don’t delay in contacting him for free info! Eddy, You were fantastic! The kids liked you just as much as you liked them. I have been singing your praises since the party and gave every one of our guest at the party your contact information card.Thank you! I will definitely keep you in mind for any future events! Eddy was a big hit with both kids and adults during our recent block party! Thanks for a memorable time!! Eddy did a great job at our son's 10th birthday party. He engaged the kids and adults who stayed. Everyone had a great time and I am sure we'll have him back in the future. Thanks Eddy.